I recently finally made it down to the new location of O Tannenbaum, a handsome bar known equally for both serving really delicious Belgian beer and having fun parties. Tannenbaum’s one of those places where a few quiet drinks can very easily turn into a raucous evening. 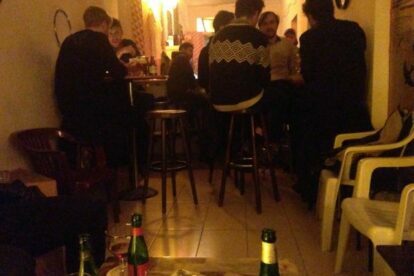 It’s not huge, and it’s always full of the young and international Nord-Neukölln crowd. The bar I used to work at would often close up shop around 03:00 during the week and kick our customers out to keep the party going at Tannenbaum, if that gives you an idea. They play great music, and host regular performances and DJs. And the drinks! Don’t let the grungy party vibe fool you – they certainly don’t skimp on the booze they serve. I recommend ordering their geuze, a Belgian sour beer with just enough carbonation. And then another one just to be sure. It’s delicious. Prost!